Offset clubs are mainly designed to help prevent slices. The head of an offset club has a leading edge that is set back from the shaft. Such clubs are also called offset hosel clubs because the hosel -- the area where the shaft fits into the club head -- is the part that’s actually bent to set the club face behind the shaft. Offset clubs are typically irons and putters, although offset woods do exist. By pushing the club head a bit farther back from the shaft line, an offset club also helps to limit slices caused by open club faces because its structure “gives the head a little more time for the club face to square up at impact,” says PGA professional Don Trahan. By offsetting the club face, impact with the ball is delayed “a split-second longer,” according to Farricker. But that split second may be all that you need to square the club face and avoid a slice. Some golf professionals worry that by using an offset club as a crutch to cure a slice, a player either won’t improve his swing and learn how to square the club face on his own, or he will improve his mechanics, in which case the offset may turn the cured slice into a bad hook. 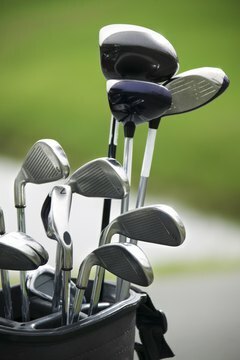 Trahan says offset clubs “serve a good purpose for helping golfers who don’t have the skills or time to develop the skills to play better golf and shoot lower scores by hitting better and straighter golf shots.” He recommends that golfers learn proper mechanics, then play with non-offset clubs. Swing Surgeon: Offset Irons: Are They for You? John Graham Golf: Offset or No Offset? What Are Offset Draw Golf Clubs?